Follow below article, you will know clearly on how to transfer and play recorded 2014 FIFA World Cup TiVo files to Apple TV 3 on Mac. 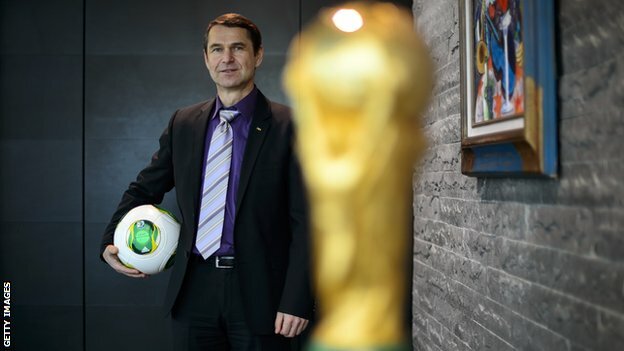 FIFA World Cup Brazil 2014 is coming on the way. Everyone is cheerful especially those football followers. However, it is hard to for them stay sticking to every second on TV without letting a splendid moment slip away. If you plan to record some splendid moment of the football matches by Tivo, it will be a nice idea to share them with your family and friends on Apple TV 3 after recording. Then whenever you like, at breakfast or during breaks, just turn on your ATV to watch it! In the following guide I would like to demonstrate how to transfer World Cup recordings from TiVo to Apple TV 3 for playing back with ease. Note: If you downloaded the TiVo files from Internet on Mac, then you do not need to do the first part. Part I: How to transfer Tivo recordings to Mac. If your original TiVo is TV shows or other videos from TiVo box, then you need to get Tivo Decode Manager to help you stream TiVo recordings to Mac. 1. Run the app, and enter your TiVo’s IP address in the TiVo IP Address box. Once the TiVo files are transferred on your Mac, then the second part will be Tivo to Apple TV 3 conversion on Mac. To convert the FIFA world cup video record, not only past 2010 FIFA, but also the upcoming 2014 FIFA World Cup in Brazil, Pavtube iMedia Converter for Mac will be the very qualified one, which can satiate your needs to convert World Cup TiVo shows to Mac iTunes compatible formats without quality loss for smoothly streaming with Apple TV 3 or other iOS/Windows/Android devices. Step 1. Load Tivo files. Free download the best Tivo to ATV 3 Converter for Mac, install and run this Mac program and click two icons on the top left corner to import Tivo files or the entire folder. Step 2. Choose best video format for Apple TV 3. Click the “Format” drop-down list and select “Appele TV > Apple TV 3 1080P Dolby Digital Pass-through(*.m4v)” for ATV 3. Or you can submit “apple tv” in the search box at the bottom right corner. Click “Settings” to enter “Profile Settings” window, you can free set video size, frame rate, bitrate here. If you want to get smaller video file, lower the Bitrate. Check the “Trim” tab, enter the start and edit time manually, or you can drag the small point on progress bar. There’re are two small icons to let you adjust frame by frame. Don’t forget to click “Ok” to confirm the change. Click the big red “Convert” to start converting World Cup Tivo recordings to MP4 for Apple TV 3 on Mac OS X. After the conversion, click “Open output folder” to quick locate the converted video. 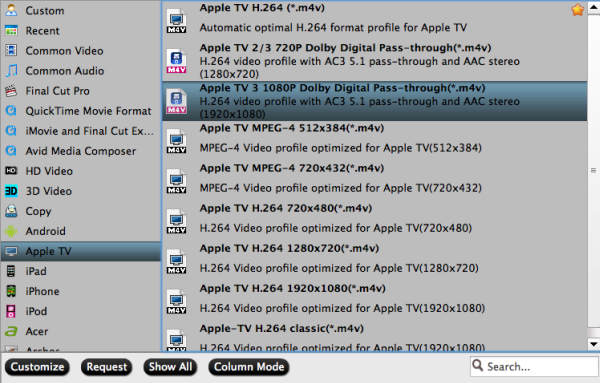 PS: Transferring TiVo recordings to Mac is not that easy and straight-forward as to PC. 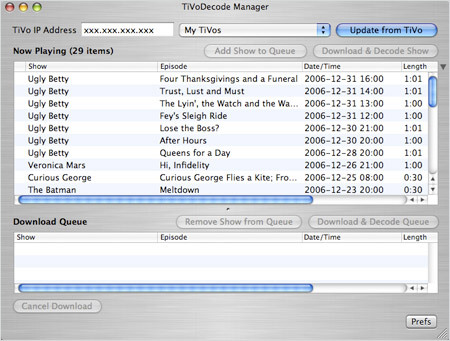 The TiVo Desktop software for the Mac (supplied by TiVo) does not allow user to transfer TiVo recordings to Mac, here I take some help from the freeware TiVoDecode Manager which gives you some of the features for taking content from your TiVo, moves it over to your computer, and automatically adds it to iTunes. Although it does have support for conversion, the quality of the result videos is poor and converting speed is so slow yet the output for apple devices are terrible. Having tried On Apple TV 3, I browsed the iTunes library for the movie and it played the converted my tested TiVo shows smoothly. I found the quality to be excellent and see no difference when compared to playing the TiVo recordings themselves.